Organizational culture and leadership articles with strategic insights from our team. There I was, sitting in the office of a senior executive who was struggling to come to terms with the reality that their organizational change effort, though having somewhat significant success initially, was not sustaining. People were quickly slipping back to old behaviors and engagement measures were sliding back to where they were when the change process started. As I learned more about the “culture” change efforts that this organization had engaged in over the last year and a half, it became clear to me where it went sideways. This leader is not alone in succumbing to this common misconception about what culture is and isn’t and I felt that it was time to take a moment to clarify a few things for the rest of my readers who may be feeling similar frustrations. The concept of organizational culture has become widely accepted as a critical component of performance in recent years. With this, I find that a great many of my discussions with leaders, often, teeter between several topics that fall within the realm of culture but are not one and the same. This reality can create some understandable confusion and frustration for people. One common situation that I find myself running into are conversations with business leaders who are attempting to evolve the cultures of their organization but who, in reality, are focusing on organizational climate. Many business leaders tend to utilize the terms organizational culture and organizational climate interchangeably, and while they share many similarities, there are several key differences that delineate them from one other. Among the many attributes a leader must possess, the most important is the ability to effortlessly transition from one leadership approach to another, in effect gliding between styles that best serve the developmental needs of those individuals they serve. Truly masterful leaders know how and when to bring those approaches to bear. A leader can be a mentor some of the time, a coach on other occasions, and a teacher when it is useful. 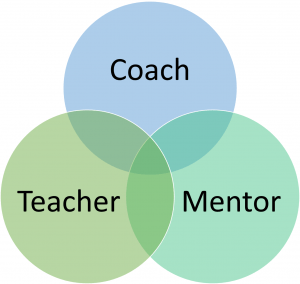 Think of the three attributes – Mentor, Coach and Teacher – as some of the most powerful tools in your leadership toolbox. Each can serve the needs of others. And notice that I intentionally don’t use the word “subordinate,” because we often are serving the needs of colleagues or team members and even bosses that have a desire to grow. It’s an important distinction, especially considering that sometimes those we serve end up being in positions that might later have a higher “rank” in the chain of command. In effect, we take turns leading others, but if the habits are there to help others on their developmental journeys, does it really matter what position she or he holds? In that regard, I often use the famous Chaucer quote, “And gladly would he learn and gladly teach,” to remind myself and clients of that philosophy. The SHRM 2019 Spring People + Strategy Journal has been published and in the Perspectives Department, Anna Tavis presents “The Adaptability Challenge.” Martin Reeves, Director of BCG’s think tank, BCG Henderson Institute, is the lead author on this topic writing about “What Makes an Adaptive Company?” Chris Cancialosi, Founder and Partner at gothamCulture, provided one of the counterpoints to the focal article with “Expanding the Lens to Organizational Culture.” To read the article and all of the counterpoints click here. Rarely a day goes by that I don’t find myself in a conversation with a client, potential client, or team member about the challenges they face with actively engaging their employees. The topic of employee engagement is certainly not new but the tactics associated with engaging employees continues to evolve. This evolution is spurred on by a variety of factors, including technological innovation, and people’s ability to repurpose existing methods in the employee engagement arena. Take, for example, the prominent use of video conferencing applications in the workplace. Technological advances in both video and in internet bandwidth have created an opportunity for many businesses to capitalize on remote work options for employees that would have never been possible just mere years ago. Another such reinvention of a popular communication vehicle in today’s society is the use of podcasts by corporations as a way to engage their employees. Take, for example, the wildly popular Trader Joe’s podcast. Originally intended to be a limited, five episode, release, the popularity of the effort evolved into an ongoing phenomenon that customers love as well. 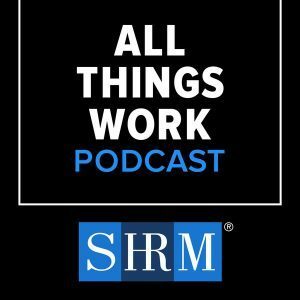 Podcasts may be all the rage, but they might not be the silver bullet your organization is looking for to engage your employees. In an effort to dive a bit deeper into the topic, I spoke with two experts to understand their opinions on when and why an internal, corporate podcast may be the right solution for you. Our current principle Run Farther Together represents how valuable it is to bring others along with us on the journey unified around a clear purpose. The benefit is not just better results, but a deeper, positive impact on the people and the world around us. But it takes courage and uncommon sense to expect more and define the destination beyond the normal measures of success. Without courage, leaders of companies today, like individuals, live in a place of permanent uncertainty and weakness. Without bravery, perseverance and honesty there is little hope for change in circumstance and zero chance of achieving one’s full potential. Those who live in a state of fear wait endlessly for others to make the next move and operate with uncertainty, reacting to others. They are relegated to miserable vulnerability and insecurity. Courage is the essential ingredient for both survival and growth, and as Winston Churchill so eloquently put it, “Courage is rightly esteemed the first of human qualities because it is the quality that guarantees all others.” It’s evident at birth and embedded into the first steps that an individual or a company takes, or it’s found as a result of hardship and circumstance. Without courage, we go nowhere. Customer experience is a memory. An impression that can stick in the mind for a minute or a lifetime. A positive experience can result in lasting loyalty, endorsement, and evangelism. A poor experience, on the other hand, can almost instantly mean the end of a brand relationship. PwC reports that 79% of customers rate customer experience as the most important component of the purchasing decision after product quality and price. According to this research, 59% of consumers who love a brand are prepared to forsake it after having a series of poor experiences. The firm also claims that 17% will walk away after only one bad experience. Needless to say, this is concerning for any business. In order to create amazing customer experiences, companies need to ensure that they have the appropriate bedrock in place to enable brand and culture to be successfully integrated. In this article, we will discuss the three primary foundations – purpose, promise, and values. “Assume capability, not intent,” is part of a military maxim used in intelligence. While somewhat more arcane when employed in intelligence, its shortened form can serve as an effective and simple reminder of how to approach those with whom we interact in the business world. “He doesn’t care,” you say about one person. “She has an agenda she’s trying to push,” you smugly say to yourself about another. What’s the common denominator of such narratives? They are all judgment based and blindly come to conclusions about the intent of each individual, based on nothing more than opinion and feelings. As such they do nothing to enhance our personal and professional relationships and thus materially contribute to distrust, making them detrimental to how a team operates. New York, NY – gothamCulture Partner and Founder, Chris Cancialosi, will support at the 2019 Society for Industrial and Organizational Psychology (SIOP) Early Career Practitioner Consortium in Washington D.C. on April 3, 2019. SIOP’s Early Career Practitioner Consortium is a one-day career development experience for early career I-O professionals who work in non-academic settings. For more information about the conference click here. SIOP is the premier membership organization for those practicing and teaching I-O psychology. While an independent organization with its own governance, SIOP also represents Division 14 of the American Psychological Association and is an organizational affiliate of the Association for Psychological Science. Chris Cancialosi is a recognized expert in the fields of leadership and organizational development, with a focus on the role of leaders in shaping high-performing cultures. Chris has worked with senior leaders across industries and sectors to design and deploy organizational transformation processes aimed at creating and sustaining effective large-scale change. Chris is an experienced advisor and executive coach with a reputation for providing critical insights and engaging customized solutions; he effectively combines his operational field and entrepreneurial experience with his knowledge of organizational psychology to provide unique practical support to his clients as they navigate today’s business landscape.